Bitpie supports multi-destination to send Bitcoin. It is much more convenient for some frequent users to use. When fill in Destination, you can cope and paste it, select it from your Address Book, or scan it by QR Code of Destination. After entering in the specific amount and destination, you should check it firstly and then click ‘Confirm’. In order to secure your money, Bitpie will let you check it once again whether the transaction is no problem by seeing Destination, specific amount, and Miners’ Fee. Here is a detailed explanation about Miners’ Fee: it is charged because miners put your transaction in Blockchain after when you make this transaction; however the two functions – Send and Receive are free. In addition, there maybe is crowded in Blockchain, so Bitpie has set the much more preferable Dynamic Miners’ Fee that is calculated according to the amount of the transaction. Consequently, I suggest that you use Dynamic Miners’ Fee to prevent special circumstances occurring in the transaction like a long time to trade or not to confirm. Some of you always reflect a situation: even though there is 0.1 Bitcoin in wallet, why would it show the balance is not enough to send 0.1 Bitcoin? 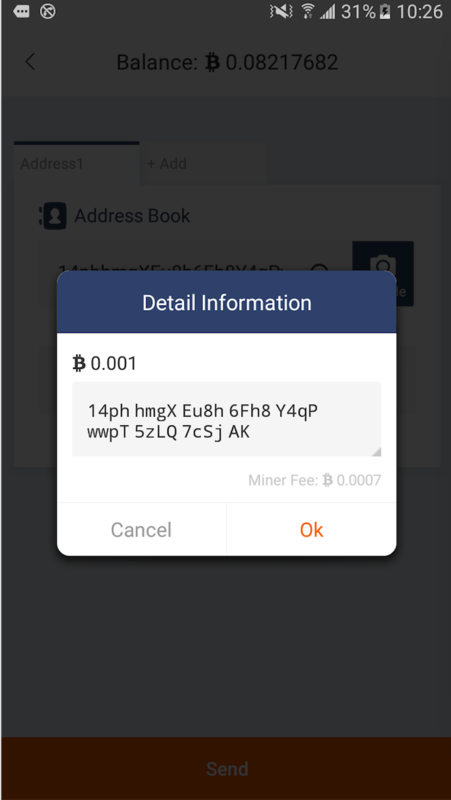 Please don’t forget Miners’ Fee because Miners’ Fee is deducted from your balance. Please remain enough Miners’ Fee in wallet. Clicking the lower right ‘+’ —Receive to show My Address interface. 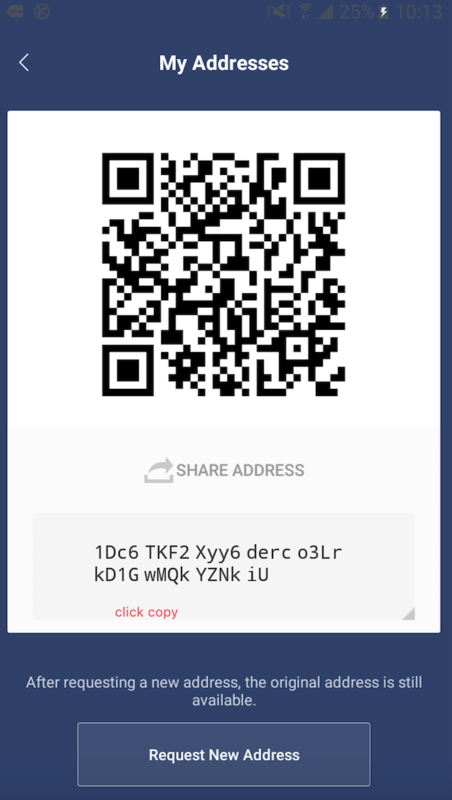 This is your wallet address. 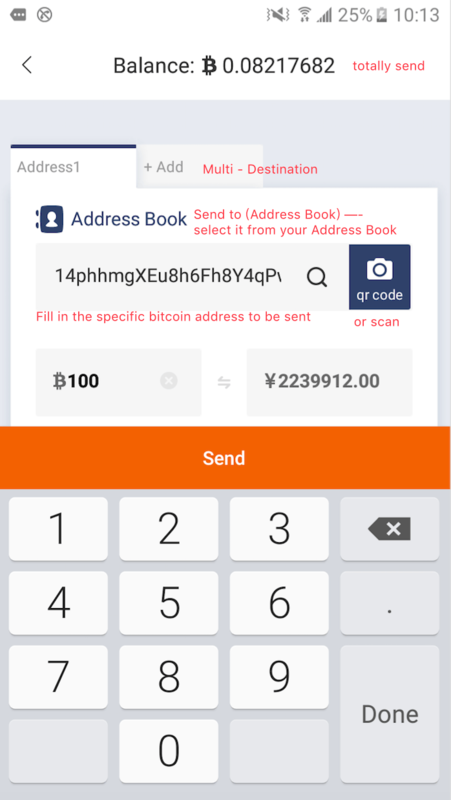 If would like to receive Bitcoin, you send it to your account address. Each time when you request a new address, there are ten new addresses, and meanwhile the old address can also be used, which you can find on my Address. What’s more, you can also press your old address for a long time to add it in Address Book, and then make a note to facilitate the next use.